Not much sand. Mistra is not the ideal place to go for a swim, but you could still spend a quiet afternoon reading a book on a chair. The road practically touches the beach, and most of the sand is covered with small pebbles which make it rather uncomfortable to walk around bare foot. But if you like alternatives or you're just curious, prepare a picnic and go. Cycling to Mistra is also a very good idea. One long road, lots of nature and very quiet. Getting there. 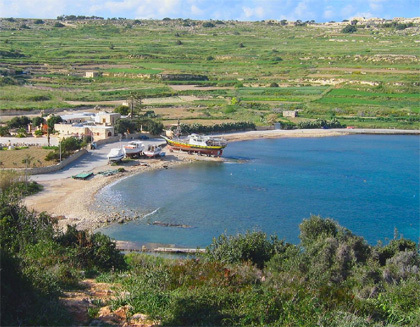 Follow directions to the Gozo Ferry, after Xemxija you'll see signs to Mistra Bay. Buses No. 43, 44 and 45 will pass from there. Stop one stage after the Xemxija Church which is on the hill. You'll have to walk about half an hour on a quiet road to get there.